According to Representative Blake Farenthold (R-TX), three “female senators from the Northeast,” are to blame for the Senate’s inability to repeal Obamacare. On Friday, Farenthold told radio Corpus Christi radio host Bob Jones that the Senate’s refusal to pass the bill was “absolutely repugnant.” “The fact that the Senate does not have the courage to do some of the things that every Republican in the Senate promised to do is just absolutely repugnant to me,” Farenthold said. The Texas Representative placed the blame on Senators Lisa Murkowski (R-AK), Shelley Moore Capito (R-WV), and Susan Collins (R-ME). “Some of the people that are opposed to this, there are female senators from the Northeast... 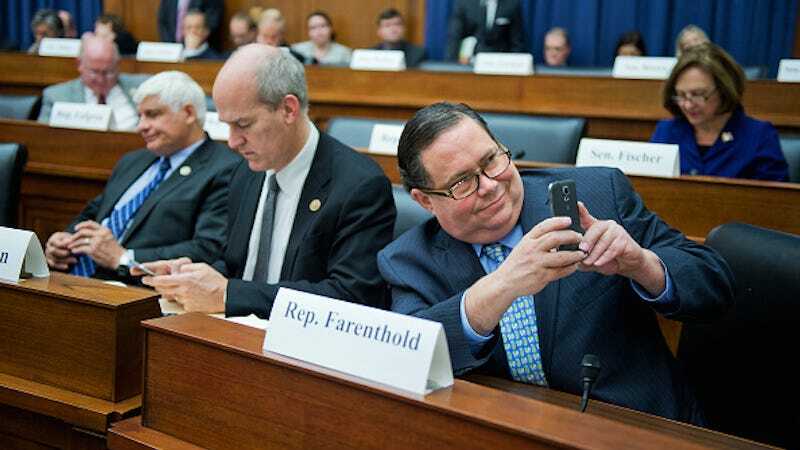 If it was a guy from South Texas, I might ask him to step outside and settle this Aaron Burr-style,” Farenthold told Jones without any sense of neither self nor irony. Much has been made about Murkowski, Capito, and Collins’s refusal to back either the Better Care Reconciliation Act or a flat repeal of Obamacare. Each refused to back the BCRA in its initial form for a variety of reasons, ranging from affordability to the bill’s lack of funding for the opioid crisis. Capito was especially concerned about the BCRA’s reduction in Medicaid spending, which would have a disproportionate effect of West Virginians. “West Virginia has the largest Medicaid population in the country. I recognize that many West Virginians rely on health coverage and access to substance abuse treatment because of my state’s decision to expand coverage through Medicaid,” Capito said in June. Murkowski and Collins both expressed concerns over affordability. The three senators, too, refused to back an Obamacare repeal. Politico reports that “Sens. Susan Collins and Lisa Murkowski are being treated as lost causes in informal whip counts, effectively dooming [Obamacare repeal] out of the gate.” It’s worth a reminder that Mitch McConnell is the architect of his own destruction here. None of the five women Republican senators were invited to be members of the Senate’s health care working group (it consisted of 13 men). Only after public pressure was Capito invited to sit in on one of the meetings, but was never asked to join the group. The fact that senators still don’t know exactly what they’ll be voting to begin debate on has opened GOP leaders to criticism about the process and further complicated their task. In addition, the Senate parliamentarian has raised a number of questions about whether key provisions can even survive the chamber’s byzantine rules. But rather than grappling with the GOP’s merciful failure to either repeal or replace Obamacare after years of trying to do so, it’s easier to blame three women.